Home > Shop By Brand > McKee's 37 Waxes, Compounds, Coatings > McKee's 37 N-914 Rinseless Wash 128 oz. A 4-use-in-1, hyper-concentrated formula for a clean finish – without the water! McKee’s 37 N-914 Rinseless Wash take some of the most often used formulas in the car detailing industry and combines them together in a hyper-concentrated blend for the ultimate in paint cleaning! McKee’s N-914 is more than just a rinseless wash; when diluted accordingly, N-914 can be used as a waterless wash, a clay lubricant, or a paint prep! This no-nonsense formula will not alter the look of your wax, coating, or sealant – McKee’s 37 N-914 simply leaves a clean surface behind! When it comes to smart shopping, finding a product that gives you more bang for your buck is like winning the lottery. Imagine if you found a toothpaste that could also wash your hair, clean your face, and season your pasta – you’d never buy plain old toothpaste again! That’s the feeling you can expect to get when you try McKee’s N-914 Rinseless Wash for the first time. McKee’s 37 N-914 Rinseless Wash owes its versatility to an advanced surfactant that creates a protective layer of lubrication and prevents marring, swirl marks, and scratches caused by dirt, grit, and synthetic clay being rubbed over the surface during cleaning. 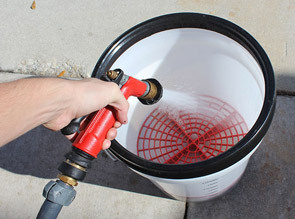 Water restrictions caused by droughts, severe winter weather, or simply no access to an area for car washing all lead back to the use of a rinseless wash. These highly-useful formulas allow you to always have a clean finish (even without the water) and Mckee’s 37 N-914 is no exception. In fact, McKee’s has taken it a step further by turning their rinseless wash into a 4-in-1! McKee’s 37 N-914 uses an advanced formula to clean paint of all surface debris – including oils found in polishes and compounds Yep, you read that right! You can use McKee’s 37 N-914 to prep your paint for application of a paint coating! Show me another rinseless and waterless wash/clay lubricant that can do that! Let's check out the McKee's 37 N-914 in action! To really test the McKee's 37 N-914 Rinseless Wash, we had to find a car with some serious dirt and grime build up. This Honda fit the bill perfectly! After adding 1 oz. 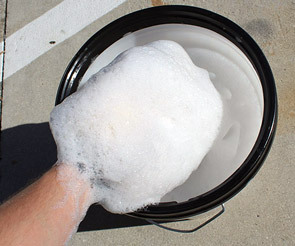 of McKee's N-914 Rinseless Wash to a 5 Gallon Bucket equipped with a Grit Guard, we added 2 gallons of water and mixed using a strong jet of water. Look at the amount of suds were created with just 2 oz. of McKee's 37 N-914 Rinseless Wash! 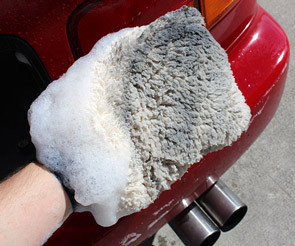 Using the Ultra Soft Microfiber Rinseless Wash Mitt (designed specifically for use with a rinseless wash and adorned with long fibers perfect for grabbing dirt and grime safely), this bumper was washed thoroughly. 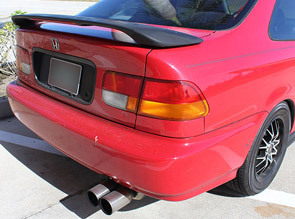 Due to the state of this Honda's paint, we've decided to keep its owner anonyomous (for obvious reasons). 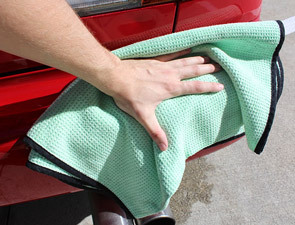 Once the bumper was clean of all dirt, debris, and road grime, a 20 x 40 inch Supreme Guzzler Waffle Weave was used to both rinse and dry the freshly washed surface. As you can see, McKee's 37 N-914 made quick cleaning work of this filthy bumper - without risk of washing induced swirls and with reduced water use! When diluted accordingly, McKee’s 37 N-914 will not alter the look or feel of your paint coating, paint sealant or carnauba wax – this highly concentrated formula does not contain protective polymers or glossing agents and leaves you with only a purely cleaned surface. 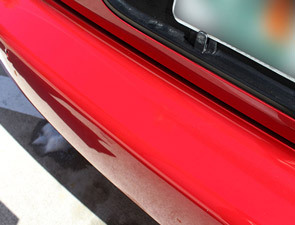 When you have a vehicle with ceramic coating you want a rinseless wash that will not leave gloss enhancers or polymers behind because those "clog" the ceramic coating and reduce its effectiveness. N-914 is great for that. I'm using that on my wife's car which I coated with Mckee's 37 Paint Coating and the results are great. It also has other uses based on different dilution ratios. Ok, after seeing all the reviews and whatnot I finally pulled the card out and ordered a 16oz bottle to sample yet another rinseless wash product. Now, I have my gold standard that has long been gone - Chemical Guys Eco Hose-Free Wash. Love it as a pre-spray and for 'dirty' vehicles. Well, now N-914 has stepped up the game and become my new standard. Just have to figure out how to deplete my gallon of Pinnacle with wax. ProsSmells good, removes dirt easily, very slippery even at 4 capfulls to 3.5 gal of warm water. Rinses dirt easily from washmit.